We are thrilled to announce that PharmaLogics Recruiting received a Gold Stevie Award for Achievement in Equal Pay. PharmaLogics’ CEO, Megan Driscoll, accepted the award at a gala dinner at the Sheraton New York Times Square hotel on Friday evening, November 16th. The Stevie Awards for Women in Business is an international competition produced by the creators of the prestigious International Business Awards and American Business Awards. The Stevie is widely considered to be the world’s premier business award. 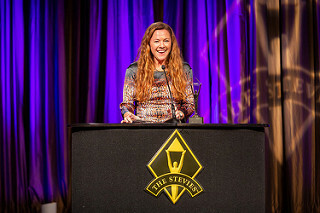 Back in 2015, Megan Driscoll won the Stevie Award for Female Entrepreneur of the Year. This year, the Achievement in Equal Pay was a brand-new award category that we’re thrilled to be a part of. The award for Achievement in Equal Pay recognizes organizations that have taken active measures to ensure that women in their employ receive equal pay for the same work performed by men. PharmaLogics is incredibly proud to have no gender pay gap. As a company focused on placing top talent at life science organizations around the world, we feel strongly that in order to do so we must provide our employees with a fair and equal workplace. Making the pay of PharmaLogics employees transparent is one of the ways in which we do this. Our employees feel confident there are no pay inequalities within our organization and that they are paid equal pay for equivalent work, regardless of gender. Apart from providing an environment of equality internally, PharmaLogics is passionate about utilizing our platform within our own industry to promote broader societal change. We have created a resource to address pay inequality (www.wagetransparency.com) in order to provide advice to employees and employees how to approach wage transparency conversations. We are so excited to be awarded this Stevie and plan to utilize this platform to further our mission of advancing the Equal Pay agenda and making strides toward pay equality.